This summer, As You Sow will publish a report on the world’s most controversial herbicide. Our report will tell the story of glyphosate (sold by Monsanto under the brand name Roundup) and expose the failures of government regulators to act in the public’s best interest. We will break down all of the news, research, and misinformation; and share our recommendations about the most-used herbicide in history. 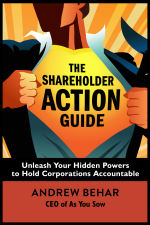 The Shareholder Action Guide distills As You Sow’s 25 years of experience into actionable knowledge for everyone who wants to make a difference.